The Hudson Valley now has a dedicated muay thai program in the heart of LaGrange, NY. 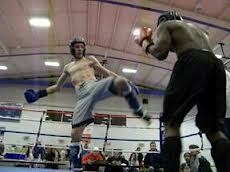 Precision Mixed Martial Arts is the Hudson Valley’s best equipied and most reputable muay thai program. Muay Thai is known as the “art of eight weapons”. 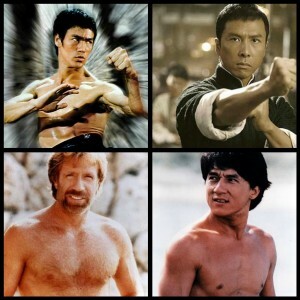 This title has been given due to the art’s dynamic striking which involves kicks, knees, punches and elbows. Not just for competitors, Muay Thai training also offers Hudson Valley residents a fantastic way to learn effective and realistic self defense while building strength and losing weight. Precision Mixed Martial Arts brings together Hudson valley martial artists from all walks of life with a variety of different programs available to suite each person’s unique goals. If your goal is to get in the best shape possible while having fun and learning new techniques then our muay thai fundamentals and circuit training classes suit your perfectly. In these classes our Hudson Valley muay thai coaches put students through routines that will challenge students to reach new heights of fitness and martial arts. Our Hudson Valley martial arts coaches are not drill instructors. You’ll be learning muay thai in a safe, clean and encouraging environment where the energy is high and the atmosphere is positive and supportive. A common misconception is that you have to be “in shape” before joining muay thai. This is not true; in fact our instructors will work with you to help you reach your potential, even if you haven’t exercised in years. We’ve helped hundreds of people throughout the Hudson Valley transform themselves through our muay thai programs, we want you to be our next success story! Already experienced in muay thai and looking to take your training to the next level? Are you a competitor or wish to become one? 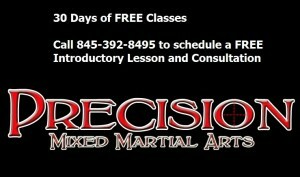 Precision has the perfect Hudson Valley Muay Thai program for you as well. The head muay thai coach at Precision Mixed Martial Arts is Karl Nemeth. Karl is a three time AKBF (American Kickboxing Federation) Muay Thai Champion. The AKBF is the largest muay thai competition in the Hudson Valley and Karl is recognized as one of the organization’s finest fighters. The coaches at Precision MMA are the most dedicated muay thai coaches in the Hudson Valley and to hone their craft they train under some of the most knowledgeable coaches in the world, including muay thai legend Kaensak Sor Poenjit. Kaensak is a veteran of over 300 fights and the only fighter to twice be awarded Thailand’s prestigious title of “Fighter of the year”. Precision coaches make the journey to Whippany New Jersey every week to learn Kaensak’s incredible techniques and pass it on to their Hudson Valley students. Check out some of the incredible muay thai techniques being taught in the Hudson Valley at Precision MMA! If you live in the Hudson Valley and want to train Muay Thai there is a very special offer now available. Precision MMA is offering a 30 Day Free trial for it’s muay thai program! Call 845-392-8495 or visit http://www.poughkeepsiemuaythai.com to get started on your Hudson Valley Muay Thai journey today! Fitness fads come and go. People gain weight and see that summer is coming up and want to slim down and decide that for once they are going to choose a diet and exercise plan and stick to it. However, every fitness guru wants to sell people on their regimen and thinks that they have all the answers so how should people make a decision on what method they are going to use to get in shape? While many workouts build muscle, increase flexibility, aid with cardio and help one to lose weight, few can do all these at once as effectively as Kickboxing at Dutchess County’s Precision MMA. Our classes are taught by Muay Thai experts who have shown the ability to have conditioning when it counts the most: in the ring. They have used our Dutchess County kickboxing program to lose fat and make weight for their fights and then had the endurance and overall conditioning to win them once out there. This is as true a test of our program’s effectiveness as any. Beyond this, for anyone to stick with a conditioning program they must enjoy it, and all our students agree that kickboxing at Precision MMA is a blast. Some workouts are designed primarily to build strength. For example, heavy weight lifting, though it does also burn calories, is not going to help with aerobic endurance or flexibility. Likewise, an activity like running may help one to lose weight and aid in endurance but it is not going to produce an overall stronger athlete. On the other hand, there are sports and activities that a person may enjoy, like basketball or tennis for example, that may also aid in certain areas like fat burning and short burst cardio, but also may not help in producing an all around stronger physique. For these reasons it is important that when choosing a workout routine a person picks something which meets all the bases. It must be something they enjoy otherwise they will not be likely to keep it up for long. However, it must also be physically challenging and capable of working all of the body’s major muscle groups, as well as helping one to achieve better cardio and flexibility while aiding with weight loss. Kickboxing at Precision MMA in Dutchess County meets all these requirements. First of all, our Kickboxing workouts help our students to become physically stronger without making them muscle bound like heavy weight lifting would. Our circuit classes in particular involve a number of different exercises which will make our athletes stronger while also improving their cardio and helping them burn fat at the same time. Simply hitting the pads and heavy bags with Muay Thai Kickboxing in Dutchess County’s varied arsenal of punches, kicks, knees and elbows will help a student to become stronger in all the major muscles in their arms and legs. However, our Kickboxing circuit classes also include many bodyweight exercises like pushups, situps, pull ups, chin up and planks. These exercises can aid in facilitating core strength, stronger chest, back and abdominal muscles and also help the athlete to gain a greater sense of awareness of their own body and how its various parts interact which is very important in martial arts. A good push up, for example, is similar to a good punch in that it is easier for the student to perform if done with proper technique and relaxed muscles. Tense muscles in particular tend to become fatigued more quickly, and something like heavy weight lifting is more likely to do this than body weight exercises or throwing a series of strikes in succession. Movements like pushups also aid with punching power themselves since some of the same muscles are focused on such as the triceps. The constant kicking techniques employed in our Muay Thai Dutchess County Kickboxing program increase our students’ overall leg strength in all the muscle groups from the calves to the thighs and hamstrings and also strengthen core muscles due to the fact that proper balance is required while standing on one leg, and improve overall balance as well. Kickboxing’s many flying attacks also add to one’s explosive leg strength and calve strength. In addition to producing stronger athletes the Kickboxing program at Dutchess County’s Precision MMA also helps our students to gain better aerobic and anaerobic cardio. Both our regular and circuit kickboxing classes require our students to throw constant punches, kicks, knees and elbows for up to an hour and a half at a time with only short rests in between rounds. This produces anaerobic and short burst cardio like nothing else because students sometimes end up throwing close to or over one hundred kicks, punches, knees and elbows within only a few minutes. As such, their bodies quickly adapt to high-energy expenditure in minute intervals which is something many other sports and workouts cannot produce in the same way. This also helps students learn the value of pacing themselves in their workouts, something which is not stressed in every workout routine either. It doesn’t take Kickboxing students at Dutchess County’s Precision long to realize that if they throw every punch and kick with one hundred percent power every time that they will soon tire and be unable to finish their workouts. When students finally learn how to pace themselves they make it through their workouts and find their cardio skyrocketing as it adapts to the activity, and their striking technique also improves because more precise punches and kicks are more energy efficient than sloppy ones and can be fired more rapidly without fatigue. But one of the biggest concerns for both men and women looking for a good workout routine is weight loss. Many people are under the impression that they need to spend hours a day on a treadmill or exercise bike in order to burn off fat and it just isn’t the case. Often times twice as many calories can be burned in a short period of time with a high intensity workout like Dutchess County kickboxing as in a long and tedious treadmill session. We have had multiple students lose in excess of twenty to fifty pounds through our kickboxing workouts when they could not lose close to that amount through other workouts like running and lifting weights. Essentially, the high volume punching and kicking found in kickboxing combined with the constant foot work involved make our workouts similar to a combination of high repetition-low weight-lifting and jogging in intervals. Each strike a student throws works numerous muscle groups while at the same time their focus is to never stop moving their body as a whole until the round is over because if they did it would not simulate the pace of a kickboxing bout and our goal is always to get our students in fighting shape. Finally, we at Precision MMA in Dutchess County pride ourselves on making our Kickboxing classes enjoyable for all students and this is key in producing results from any workout because a workout cannot be effective if one doesn’t continue with it in the long term. For too many people working out is a chore because they aren’t able to find a workout routine that they actually find entertaining but Kickboxing at Precision in Dutchess County has instructors who are innovative so we are constantly switching up our classes in order to keep things interesting. Our head kickboxing instructor Karl Nemeth is particularly good at creating a fun atmosphere because he himself finds kickboxing to be such a naturally enjoyable activity and it’s hard not to get pulled into the positive mood created by a quality instructor. Lets face it, what person doesn’t sometimes want to let off some stream from their workday by hitting a heavy bag?! Channeling our aggression through a positive outlet like kickboxing naturally lowers one’s blood pressure, both by helping one to relax and through the exercise itself, and once the endorphins get flowing a good mood is naturally produced. Moreover, Muay Thai kickboxing includes techniques which are acrobatic and fun to do, like it’s many flying and spinning kicks and strikes which are highly acrobatic in nature. When taking Muay Thai Kickboxing classes at Precision MMA in Dutchess County the lines between playing, fighting and working out quickly become non-existent and the student soon forgets that they are burning fat, building muscle and increasing their cardio which is exactly what we want. Once kickboxing ceases to be viewed as a typical “workout” our students stop dreading the activity like they would going to the gym and before they know it they’ve lost considerable weight and are in the shape of their lives. It’s really too bad that most of the world sees exercise as something that needs to be boring or so exhausting that they will be unable to wake up the next morning when an activity like Kickboxing can be so fun and effective at getting people into peak condition. Usually when people come to kickboxing classes at Precision MMA in Dutchess County it’s a revelation of sorts that they can build muscle, burn fat and gain anaerobic endurance all at the same time without having to step foot in a conventional gym, lift a single weight or run a single mile. Its worked for many before and continues to work for new students everyday so get off the couch and onto the mat at Precision’s Kickboxing classes and start feeling better about yourself and your body today! Kickboxing in Dutchess County Free 30 Days! Precision MMA is the premiere kickboxing gym in the Hudson valley. We have members from all over Dutchess county, in addition to other locations in New York. To join our incredible Dutchess County Jiu Jitsu program, run by head coach Brian McLaughlin, give us a call at 845-392-8495. You can also stop in at 1097 Route 55, Lagrangeville, NY 12540. We are currently offering a 30-day FREE trial, so make sure to ask about how you can receive that!